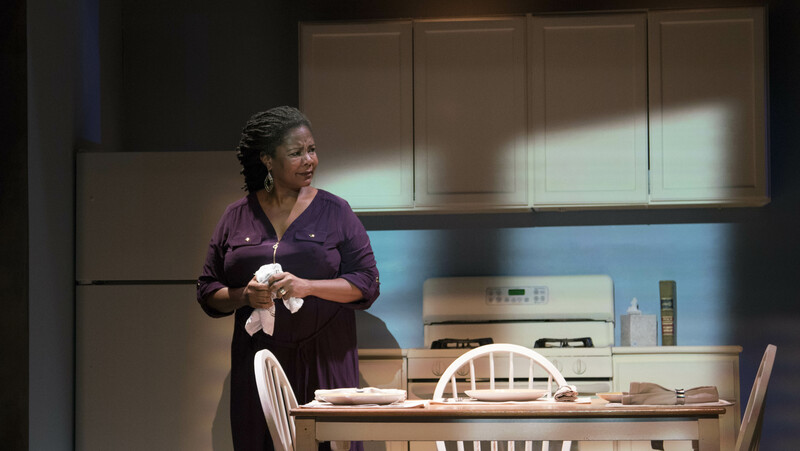 Bele Reve Theatre Co. presented the World Premiere of Alessandro Camon’s two character Time Alone at the Los Angeles Theatre Center during October. The play was basically two alternating monologues about differing reasons for being alone and the different means the characters had for coping with the loneliness. 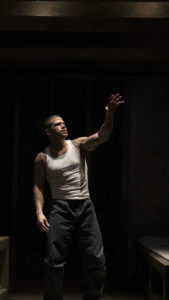 Gabriel (Alex Hernandez) told his story from the small confines of his solitary confinement cell in a California prison. Gabriel grew up in the barrio and of course became a gang member out of a sense of inevitability, self-preservation and adulation of his older brother. At 17 he killed the member of an opposing gang in retribution for the death of one of his gang’s members. His behavior and gang affiliations in prison got him more or less permanently confined to solitary confinement. He spends his days reading from the prison library and exercising in his cell. 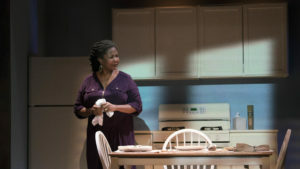 Anna (Tonya Pinkins) told her story from the comfortable environs of her kitchen where she still has a habit of setting the table for three even though she has been living alone for years. Her policeman husband died at an early age from a heart attack. Her son followed in his father’s footsteps, became a police officer and ended up being shot and killed by a drug addict during a burglary gone wrong. Camon’s writing did not add much new to the long literary litany of gangs, prisons, violence and police deaths. 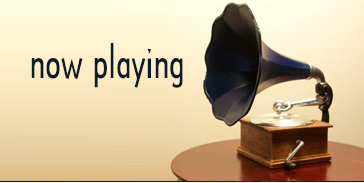 Even though their stories don’t seem to have any noticeable connection, you knew these two lost souls will somehow manage to connect. What made this two-hander watchable was the sharp direction of Bart DeLorenzo who kept the static stories moving briskly. Francois Pierre Couture provided a compact cell as well as a friendly, homey kitchen setting side by side on the LATC stage. Hernandez provided enough variation in his portrayal of Gabriel to keep your interest. Pinkins delivered more emotion in a look or a movement than was present in paragraphs of dialogue. She was a marvel to behold.